-guests arriving via own car or taking public transportation.Direction will be sent via email upon booking confirmation. Group of 1 person- VIA CAPAS TARLAC ROUTE. AFTER CHOOSING YOUR PACKAGE RATE. You can book INSTANTLY VIA PAYPAL.Credit card charges will appear on top of the tour package rate.Click the PAY NOW BUTTON. * INDICATE IF WHERE COMING FROM. IF ARRIVING VIA OWN CAR OR TAKING PUBLIC TRANSPORTATION SO WE CAN SEND DIRECTION IN THE EMAIL VOUCHER. -MINIMUM OF 2 JOINERS -OWN GROUP. *Guests if rescheduling must notify within 72 hours to avoid forfeiture and can re-book or transfer their tour to another person for 2 years grace period. *Tour can be RESCHEDULED if the desired number of pax ( minimum of 15 pax ) are not met; or guests can arrive via own car or take public transportation if they want to push through on their target schedule. Guests if rescheduling must notify within 72 hours to avoid forfeiture and can re-book or transfer their tour to another person for 2 years grace period. *Tour can be RESCHEDULED if the desired number of pax ( minimum of 10 pax ) is not met; or guests can arrive via own car or take public transportation if they want to push through on their target schedule. Guests if rescheduling must notify within 72 hours to avoid forfeiture and can re-book or transfer their tour to another person for 2 years grace period. You can book INSTANTLY VIA PAYPAL.Credit card charges will appear on top of the tour package rate.Click the PAY NOW BUTTON. * INDICATE DESIGNATED PICK UP POINT AS SPECIFIED BELOW. *Note : It is the driver’s discretion to decide departure or as soon as participants were completed. BE PATIENT when joining the FREE VAN SHUTTLE RIDE. Guests will be given OPTION not to ride the van if they want to go ahead. * 2:30 AM Call Time- [ Manila ] -MCDONALD’S CENTRIS -ETD 3:00 AM. Any early departure will be advised especially during holidays to avoid traffic along NLEX. 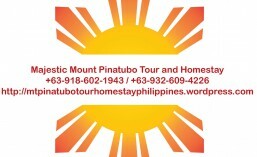 PLEASE ACCOMPLISH- REGISTRATION FORM PINATUBO TOUR -WITH OR WITHOUT MANILA-SUBIC-CLARK-TARLAC TRANSFER. NOTE : NOT FULLY ACCOMPLISHED DETAILS-ESPECIALLY DETAILS OF PARTICIPANTS-FULL NAME-AGE-NATIONALITY-NO PENCIL BOOKED SLOTS. WHERE TO MAKE RESERVATION PAYMENTS ? Note : Full Payment will be allowed VIA PAYPAL. Credit card charges may apply. Bank Name :BANCO DE ORO UNIBANK INC.
All payments will be acknowledged via email. IF VIA BDO BANK :Email the screenshot of transaction receipt. After making reservation payment, send the following details of each participants. Please Accomplish Registration-Inquiry Form Before You Call-SMS us. * FREE VAN SHUTTLE TRANSFER IF THERE ARE AT LEAST 15 PARTICIPANTS OR ARRIVE VIA OWN CHOICE OF TRANSFER IF THE MINIMUM HEADCOUNT IS NOT MET TO PUSH THROUGH WITH YOUR TOUR. IF NO FREE TRANSFER, GUESTS CAN PUSH THROUGH WITH THEIR TOUR BUT MUST ARRIVE VIA OWN CHOICE OF TRANSFER AT THE MEET UP POINT. WHO CAN AVAIL PHP 1950/PERSON RATE ? FULL PAYMENT RESERVATION DEPOSIT MUST BE MADE WITHIN 48 HOURS ONCE WE HAVE SENT AN EMAIL CONFIRMATION TO YOUR BOOKING. TO RESERVE SLOTS. PLEASE ACCOMPLISH THIS ONLINE REGISTRATION FORM COMPLETELY. Fun and Exciting ATV Rides -Php 1000 Per Person–Pinatubo Lahar Trails ! For those who are not into long hike or trek ? Not into waking up so early in the morning ? Small, Medium or Large physical frame? Now it is here…as long as you can drive or can be a back-rider-if you can’t drive….Experience a FUN and EXCITING ATV RIDES along the PINATUBO LAHAR TRAILS without spending the whole day of your time. 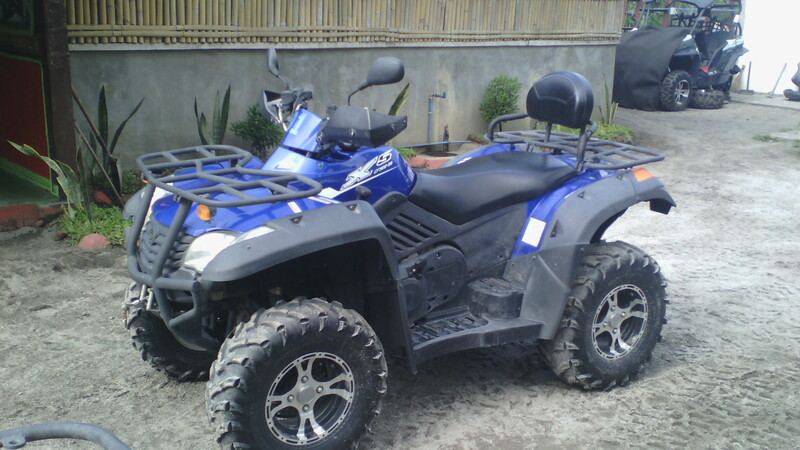 Arrive at your convenience and do your ATV Rides between 6:30 AM to 3:00 PM. PACKAGE A: Short Lahar Trail-No Pinatubo Crater Lake Viewing : All IN- Unit + Tourism Fees/DOT Fees. -this can last for 1 hour to 1 hour and 30 minutes driving along the Pinatubo Lahar Trail. PACKAGE B : Tambo Lake Trail-No Pinatubo Crater Lake Viewing : All IN- Unit + Tourism Fees/DOT Fees. -this can last for 2 hours to 2 hours and 30 minutes driving along the Pinatubo Lahar Trail going up to Tambo Lake. Tambo Lake was formed as a result of Mt. Pinatubo eruption which was originally an agricultural area. PACKAGE C: Combo Trail-No Pinatubo Crater Lake Viewing : SHORT TRAIL + TAMBO LAKE TRAIL + LAHAR CANYONS- All IN- Unit + Tourism Fees/DOT Fees. -this can last for 4-5 hours which involves driving along the Pinatubo Lahar Trail going to Lahar Canyons then going to Tambo Lake trail. Tambo Lake was formed as a result of Mt. Pinatubo eruption which was originally an agricultural area. People going to Tambo Lake can do some swimming depending on the condition of the lake. 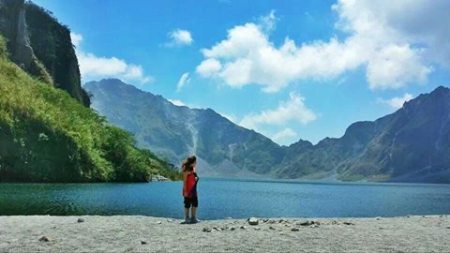 PACKAGE D: Pinatubo Crater Trail And Hike-With Pinatubo Crater Lake Viewing : All IN- Unit + Tourism Fees/DOT Fees. -this activity involves driving the ATV units by yourselves guided by either ATV marshal for about 20 kms to the base camp of Mt. Pinatubo which can last for 2 hours depending on your driving or pacing. You will need to park the ATV unit at the base camp of the 4×4 jeeps parking area if you want to hike the Pinatubo Crater which will last for about 2 hours depending on your pacing.